Armed with the black sword Stormbringer, who draws the souls of those it kills into Elric’s body, filling him with more remorse for their deaths, the prince wanders the Younger Kingdoms with his companion Moonglum. After crossing paths with the sorcerer Theleb K’aarna, assorted supernatural beings, and occasionally the Lords of Chaos themselves, Elric is whisked into another dimension. There he meets a past incarnation as well as a future version of himself and discovers that together, these three phases of the same man can do what only one can’t. Within the confines of a few brushstrokes and the brevity necessary for this type of narration, the characters in these stories are well described and deeply defined. A walking depository of guilt and self-condemnation, Elric is burdened by his accidental slaying of Cymoril, his consumption of the many souls Stormbringer gathers as it kills, and his inability to prevent his cousin from wresting power from him. Indeed, he carries the weight of the world on his shoulders. Elric is a self-fulfilling prophecy, for no matter the victory, he fully expects it to be stripped away. His own shame won’t allow him happiness, whether it is in love or triumph. Thus he always fails even as he succeeds, and he discourses on this at length, in flowery and often empurpled, prose. On the other hand, Moonglum is the voice of reason in Elric’s phantasm-laden realm. He expresses the worries of an ordinary person caught up in a world of fantasy, though he readily accepts its marvels. Intending to stick with Elric to the bitter end, he speaks his mind quite frankly, generally to no avail. The villains are truly villainous, laden with magical powers, and laughing egomaniacally as they are aided by a good many supernatural entities. No matter what their other aims, they all band together for one singular goal: the death of the pale prince. Though Elric welcomes this death, and sometimes almost succumbs, he always survives for another battle, as if part of his punishment is never to wholly succeed, but also never to completely give up. Instead, he simply lives to “fight another day,” much to his sorrow, though always to his expectation. 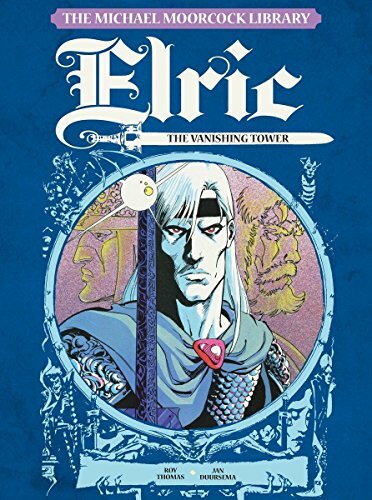 This dramatically illustrated graphic novel contains a continuation of author Michael Moorcock’s bestselling fantasy series, the saga of Elric, exiled ruler of Melniboné. With a script and adaptation of the stories by Roy Thomas, first successor to Stan Lee as editor-in-chief of Marvel Comics, illustrations by Jan Suursema and lettering by Tom Orzechowski, this volume comprises the complete six comics relating The Vanishing Tower tale. An extra feature following the story shows the original covers for the comics as sold on the newsstand, as well as a listing of the other entries in the Michael Moorcock Library series. Between the sweeping, action-packed illustrations, and the heroic script, this hardcover graphic novel collection will delight any fan of epic fantasy, and be a welcome addition gracing the shelves of the aficionado’s library.